There's something about Max. It might be his inimitable drive to help others find their racing feet (whether that's cx, road or crits) through consistent encouragement and nudging, or his ability to pace you up a climb without making you feel like a burden, but there's definitely something special there. Max will represent Bombtrack Treadly Racing in the Men's Elite category of the Australian Cyclocross National Series. A triple threat on the team, not only is Lana a formidable rider-of-bikes and one of two gifted photographers we have with us, she also makes up a quarter of the staff at Treadly Bike Shop. In 2016 she muscled her way to a top ten placing in her first National Series, and will again be representing BTR in Women's Elite. Seal has too many claims to fame to bother trying to list here, but among them she has competed for Australia in the World Cross Triathlon Championships, competed internationally in various invitational surf comps, and taken out 2nd place in the 2016 Australian National Cyclocross Championsips in Women's Masters 1. She will be defending that place and hopefully going one better in the same category this year for Bombtrack Treadly Racing! Paul might have the friendliest face on the team. He's also the only one of us racing singlespeed, and that alone gets him some points in our book! Paul is an accomplished surfer, track sprinter and paramedic (in that order, I think he'll tell you), and coupled with his everything-will-always-come-good attitude, he's a dream to be around. Paul's racing for BTR in Men's Masters 1 in 2017. 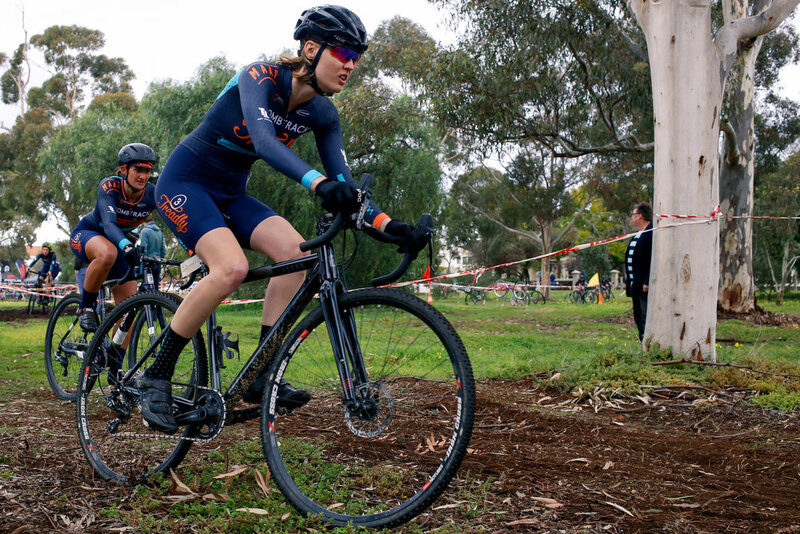 Becca has won the most races of anyone on the TreadlyCX team - so bringing her into Bombtrack Treadly Racing was a no brainer! While we all sweltered through Summer this year she went home to Portland for some cold-weather training, so she's all prepped for our series-opener in Bright again this year. Becca will race for BTR in Women's Expert. The newest member of the BTR family, Caz has come to us from Melbourne this year with a bunch of camera gear and a very fancy mountain bike. She might be the most influential person we've ever know in terms of getting people on their bikes - not just those new to the sport but even we're riding more just by her being around! Caz will be racing in Women's Expert for Bombtrack Treadly Racing. Team director/wrench and all-round gear nerd, Jake is the reason the team exists. As a mechanic at Treadly he's responsible for all of our bikes running smoothly, and he's pretty handy with a 'cross bike too. You'll often see him working on someone else's team bike just before he lines up to race, and then behind the lens every other moment! Jake will be representing Bombtrack Treadly Racing in Men's Expert.